Do Airline Mergers Make Service Worse for Passengers? Competition is supposed to create superior value and better service for customers, but the airline industry is so unprofitable that competitors try to outdo each other by reversing the usual strategy of finding ways to give customers more for less. In a business that lost $9.4 billion in 2009 and is forecast to lose another $2.8 billion in 2010, airlines strive to give customers less while charging more. That's why we see airlines taking away free food and creating all kinds of new fees for everything from exit-row seats in economy class to carry-on bags. For example, according to BloombergBusinessWeek, Continental (CAL) has stopped serving "free food in economy class on most domestic flights." And it boosted fees for "roomier exit-row seats" while copying other airlines who increased their checked bag fees. One of the saddest examples of this decline in service and rising airfares is Midwest, which merged with Republic Airways Holdings (RJET) in 2009. (Republic also bought Frontier.) I fly Midwest at least once a year, and I used to enjoy their free gourmet meals with real silverware and cloth napkins, along with their freshly-baked chocolate chip cookies. Over the years, Midwest wiped out the meals but kept serving those warm and chewy treats. According to respected travel writer Peter Greenberg, the Midwest brand is going away by October 2011, but he claims the cookies will remain. We'll see. My solution would be to give the free market a helping hand -- by getting the government to spur start-up airlines that could take business from the under-performing industry giants. If there was ever an example of the free market failing, the airline industry is it. Ever since 1978, when airline industry routes and prices were deregulated, most industry participants have been competing on service, rather than price. According to BloombergBusinessWeek, thanks to government protected profits, airlines were unable to compete on price, so they instead boosted service -- giving away free alcohol to passengers while raising the pay of pilots, flight attendants, and mechanics. But they failed on the service front in at least one key point: routing: Airlines traditionally set up their routes using hub-and-spoke networks which required travelers flying from or to smaller airports to spend hours in big cities waiting for connecting flights. Into this happy hub-and-spoke world of flowing booze and rising worker pay entered a disruptive force: Southwest Airlines (LUV), which introduced a different routing approach. Southwest's point-to-point routes let passengers fly directly from their departure cities to their destinations, without stopping in the middle at big-city airports and waiting for connecting flights. Southwest has made a profit every year since it launched about 39 years ago, while the rest of the industry has largely lost money. As I wrote in a May 2008 article on DailyFinance's sister site, BloggingStocks, (as well as in my seventh book, Value Leadership), Southwest has many smart elements to its effective strategy, including flying point-to-point routes, flying to less-popular airports with lower gate and landing fees, hedging jet fuel prices, and hiring and coddling service-oriented workers who make customers happy. If Mergers Make Airlines Better, Why Is US Airways So Bad? One way that the industry has responded to Southwest's threat has been to let the weakest companies fail. According to the Air Transportation Association, since 2000, 37 airlines have filed for Chapter 11 bankruptcy, and nine have been liquidated. This exit of players from the industry has not done much to make the industry profitable. Another response to the Southwest effect has been mergers, which in theory should lead to lower costs and better service, but those aren't having the desired effect. BloombergBusinessWeek reports that five years after merging with America West, US Airways (LCC) still manages both airlines' employees separately, and it has terrible customer service ratings. The two lowest rated airlines in J.D. Power & Associates' 2009 quality-assessment survey were US Airways and United (UAUA). And Republic lost $36.5 million in the first quarter of 2010 compared to a $2.2 million profit the year before. To be fair, not all mergers have gone that badly. Delta's (DAL) 2008 merger with Northwest Airlines has at least cut its losses from $794 million in the first quarter of 2009 to $256 million the first quarter of 2010, according to BloombergBusinessWeek. My conclusion is that airline mergers generally do make service worse. 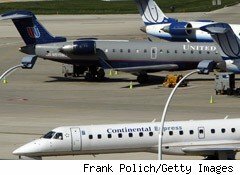 As I wrote in a DailyFinance column on May 3, the UAL/Continental merger could result in some fares doubling while on average they could rise 10% to 15% across the industry. And the US Airways merger has clearly resulted in a low level of customer service, although I am not sure how much worse it is now than it was before. Unfortunately, this decline in service quality is built in to the incentive structure for doing mergers in the industry. Such combinations put shareholders' investments at risk, and the only way to justify the risk is to promise a rapid improvement in profitability. Such improvement generally comes from lowering costs and raising revenues. But achieving those financial goals does nothing to make things better for consumers as long as the merged companies keep pursuing the same competitive strategies as before. So what is the answer? Profitable JetBlue (JBLU) has proven that Southwest does not have a monopoly on employing the point-to-point strategy. This suggests that there is no reason other airlines could not adopt point-to-point routing and other elements of Southwest's strategy. But management inertia will make it hard for legacy hub-and-spoke players to change strategy. Perhaps the answer is for the federal government to promote investment in start-up airlines that would follow the Southwest strategy. More efficient players without either the legacy costs or management inertia that hinder the older airlines could take over the routes currently being run by those traditional players, who are now likely to look for merger opportunities that will allow them to keep up with United and Continental. For the sake of consumers and workers, I hope the government can find a way to step back into the airline industry and help it navigate from its hub-and-spoke past toward a more profitable and value-creating point-to-point future.